The Hibernia production platform is the largest oil producing platform off the east coast of Canada. The produced water is the major source of contamination from the platform into the ocean. 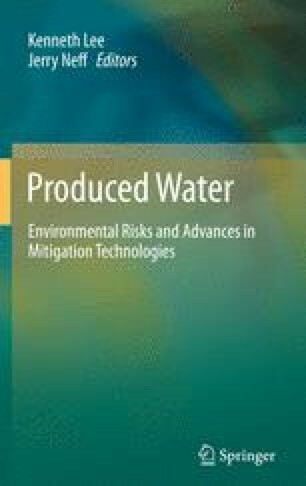 A comprehensive study on the potential impact of the produced water discharge is needed. Microorganisms can rapidly respond to change, whether negative or positive, and at the population level, are powerful indicators of change in their environment. The objective of this study was to characterize the indigenous microbial community structure, by denaturing gradient gel electrophoresis (DGGE), in the produced water and in seawater around the production platform, and to determine whether the release of produced water is impacting the natural ecosystem. The DGGE results showed that the production water did not have a detectable effect on the bacterial populations in the surrounding water. Cluster analysis showed a >90% similarity for all near surface water (2 m) samples, ~86% similarity for all the 50 m and near bottom (NB) samples, and ~78% similarity for the whole water column from top to bottom across a 50 km range, based on two consecutive yearly sampling events. However, there were distinct differences in the composition of the bacterial communities in the produced water compared to seawater near the production platform (~50% similar), indicating that the effect from produced water may be restricted to the region immediately adjacent to the platform. Specific microorganisms (Thermoanaerobacter for eubacteria and Thermococcus and Archaeoglobus for archaea) were detected as significant components of the produced water. These particular signature microorganisms may be useful as markers to monitor the dispersion of produced water into the surrounding ocean. The authors thank Susan Cobanli, Nathalie Fortin, Sylvie Sanschagrin, and Marc Auffret for their excellent technical assistance. This research was supported by Fisheries and Oceans Canada and the National Research Council of Canada.